Home Turf Why do you apply Pre-Emergent Herbicide in the Spring? Grass each spring goes through a flush of growth that sends blades straight up to the sky. During this time there are weeds that are just waiting to germinate and grow along with the grass. An effective way to combat these weeds is to apply a pre-emergent herbicide before the seeds can germinate. A barrier at the soil surface is created with the proper application of pre-emergent. This barrier will last the entire growing season to stop weeds from growing and grass to reach its full potential. 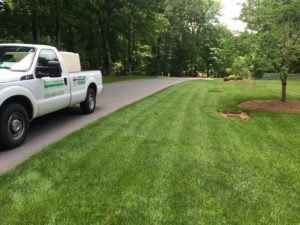 Call today for us to set up a free estimate for your lawn.